If you incur any problems or have questions please contact VDOT’s Leesburg road maintenance directly at 703-737-2010 or or VDOT’s Customer Service Center at 1-800-367-7623. The HOA is not permitted to plow VDOT roads. If you live in a patio home or town home the snow plowing is performed by the Association’s contractor. In addition, the contractor will be plowing Susan Leslie Drive, the clubhouse parking lot, sidewalks at the clubhouse, school bus stops and communal mailbox kiosks. If you have a question or think an area was left out – call our community manager to report it. Remember, if the VDOT streets feeding the townhome area are not cleared, the contractor may not be able to access the community. Please remember that each homeowner and renter is responsible for clearing the sidewalks in front of their home. 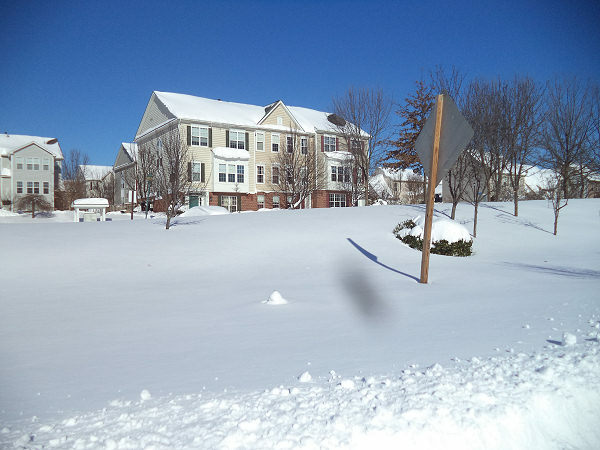 Reference the Loudoun County Ordinance for Removal of Snow and Ice from Sidewalks. School walk zones: Owners will have to treat the sidewalks that abut their property. Reference the Trailside Middle School Walk Zone map. Snow Removal Map – yellow triangles indicate where residents should not park so the plow can use those parking spaces to pile up snow. Check the Trash Removal page for information on trash collection during bad weather. Who is responsible for clearing sidewalks or trails? VDOT does not remove snow from sidewalks or trails. 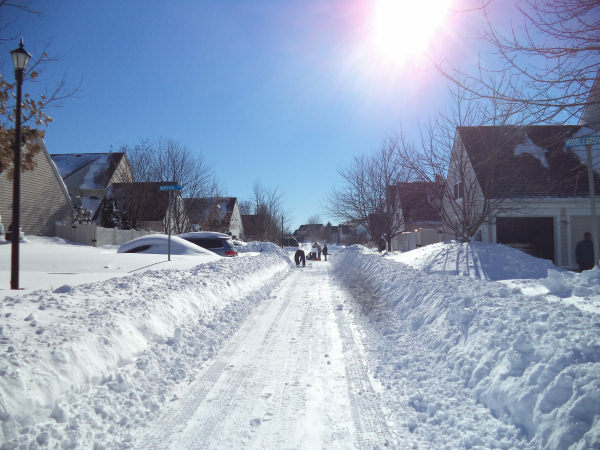 Loudoun County requires homeowners to clear sidewalks adjacent to their homes. Our snow plowing contractor will remove snow from school bus stop locations, communal mailboxes and as requested by the community manager, can be paid to remove snow from the sidewalks at the Community clubhouse. Who is responsible for clearing community parking spaces? Community parking spaces will be plowed by the HOA’s contractor if there is sufficient room to do so. This typically means there must be at least 4 continuous spaces (more for parallel parking spaces). Areas obstructed by parked vehicles will not be plowed. It is therefore important to use driveways where possible when heavy accumulations of snow is expected. What should my HOA plowed street look like after a major snowstorm? During snowstorms of 8 inches or more, your street will have only one travel lane plowed initially and it may be snow-packed, making all-weather tires a must. 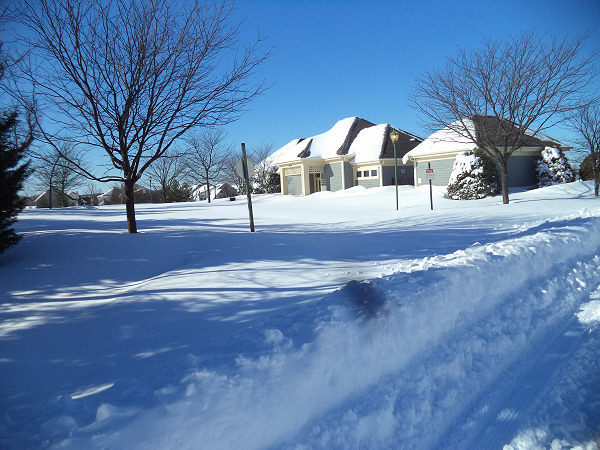 Crews will continue plowing until your roadway is clear or instructed by the HOA to stop. Snow may be piled in areas of the town house parking lot. Parking areas may not be cleared unless requested by the Community manager. Why is the plowing limited as described? 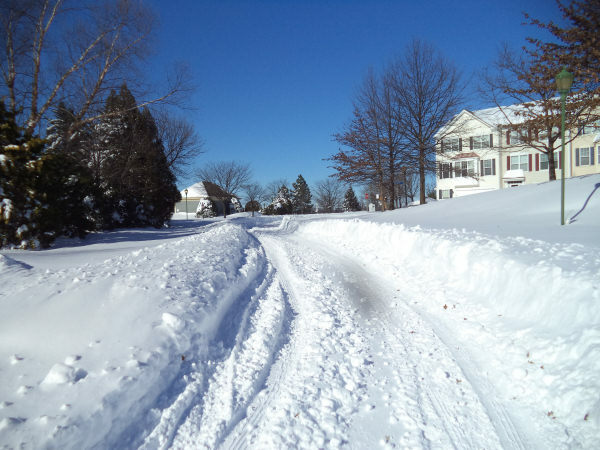 HOA owned streets are plowed at a cost to the residents of the HOA. Everyone in the community contributes to the plowing of shared facilities such as Clubhouse parking lot, Susan Leslie Drive and School Bus stops. Only Patio Home and Town Home owners contribute to the plowing of the streets that service them and the communal mailboxes. Typically each Patio Home and Town Home owner pays less than $20 per year (2010 budget) toward snow plowing, this is adequate for most seasons and any surplus is placed in reserve funds for those years with excessive storms. Providing a higher level of service will directly impact Patio Home and Town Home owners HOA fees. We try to strike a balance between the service provided and the cost to provide the service. Patio home and Town Home streets will be cleared of snow to the same standards as VDOT roads. Any further snow removal such as the clearing of driveways and parking spaces (that were unable to be cleared at time of plowing) will be the responsibility of residents of the community. Loudoun residents can enter their address at www.vdotplows.org to see the status of plowing in their neighborhood. Please use garages and driveways where possible. If you need to park in the road please try to all park on the same side. This way snow plows will be able to clear the roads more effectively and make for safer driving. Do NOT clear snow from your property into the roads. This just makes the roads even more treacherous to pass. To make our community an easier and safer place to walk after snow, clear other sidewalks adjacent or near your home. Think of those less able than yourself. Elderly people and people with disabilities may require additional assistance. Clear the snow away from the fire hydrants so that emergency personnel can find them quickly if needed. Clear snow away from mailboxes such the mail delivery van is able to insert your mail without exiting the van. As the snow begins to melt, it needs someplace to go. Clear the snow, ice or debris away from the bottom of the downspouts at ground level. This will provide a pathway for the melting snow. Make sure that the snow is cleared from storm drains to prevent pooling and icing that may result from melting snow. Do not climb on your roof to remove the snow or ice.